Anya Cherneff is the founder of Empower Generation (recently merged with Pollinate Energy) —a social enterprise that trains and supports rural women to lead inclusive businesses that deliver clean energy solutions to urban slum and rural communities in India and Nepal. As a feminist defender of social justice, fighting to end modern day slavery and human trafficking, Anya applies a market-based approach to reducing inequalities and creating economic development. Anya has overseen the recruitment, training, and business incubation for over 500 rural entrepreneurs, who have collectively reached more than 300,000 people in Nepal. She is an alumna of the Miller Center Social Entrepreneur Fellowship, TEDx Zurich Speaker, C3E Women in Energy International Leadership Awardee, a SOCAP Social Entrepreneur Fellow, and most recently is the winner of the Ashden International Award in the Clean Energy for Women and Girls Category. 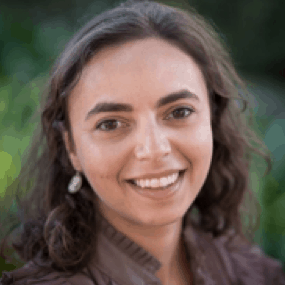 Anya holds a MA in International Human Rights from the University of Denver and a BA in Anthropology from Columbia University. "Collaboration" is a popular buzzword in the social impact sector, but many energy access firms ventures invariably find themselves vying with one another for customers and resources. Anya Cherneff, founder of Empower Generation, chose a different direction to grow her business' mission of empowering rural female entrepreneurs: She joined forces with Pollinate Energy – a key competitor. Cherneff discusses the decision – and its ongoing impact on both companies – in this insightful post.